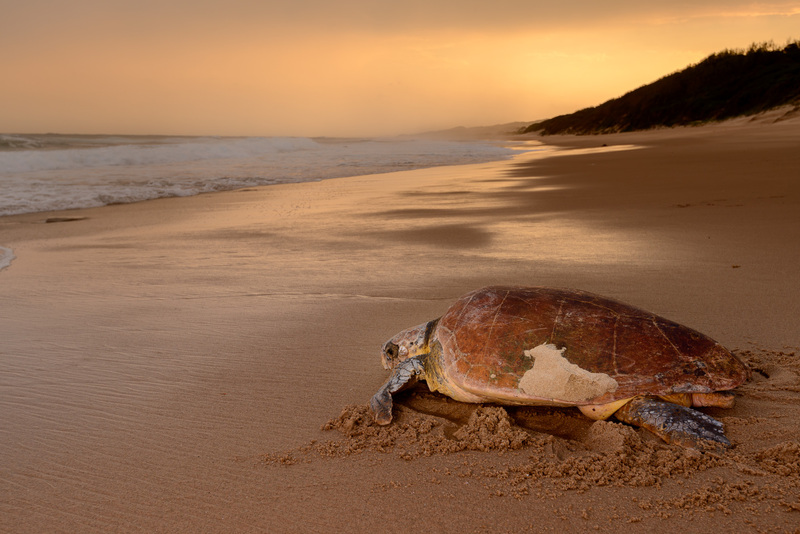 The nightly ritual of turtles emerging on the shores of the iSimangaliso Wetland Park, a World Heritage Site, to lay their eggs first caught the attention of scientists in the 1960s along the KwaZulu-Natal coast. While this had been an extraordinary experience to witness over the years the critically endangered Leatherback and threatened Loggerhead turtle populations began to decline. It soon became evident that these animals were being killed for their meat, and their eggs were taken illegally by local communities living along the coast. To advance the much-needed protection of the nesting turtles, the Ezemvelo Turtle Monitoring Programme was initiated. To tackle the decline in the nesting turtles’ population, the programme’s aim was, and still is, to turn the poachers into custodians. The programme has seen significant job creation within the coastal communities and created a sense of ownership for the wildlife and the environment along the coastline. To date, due to the initiation of the turtle monitoring programme, the Loggerhead turtles have experienced a significant increase in numbers, while the nesting Leatherback turtle population is stabilising. There are approximately only 80 nesting Leatherback and 935 Loggerhead turtles that visit our shores annually. The continuation of this programme is necessary as it is their only chance of survival. Turtles play an important role in maintaining the health of the world’s oceans. Their roles range from maintaining productive coral reef systems, to transporting essential nutrients from the oceans to beaches and coastal dunes. As the turtle population declines, so does the ability to fulfil vital functions in ocean ecosystems. To keep this programme running, WILDOCEANS, a programme of WILDTRUST, has launched a crowdfunding campaign in partnership with Ezemvelo KZN Wildlife and DIFFERENT.ORG. The goal is to raise R300 000 for the programme by the end of December 2018. To donate, spread the word and make a difference, simply click on the following link: https://different.org/projects/wildlands-conservation-trust/safeguarding-and-monitoring-turtles/. “We’re excited to be partnering with WILDTRUST for this hugely impactful programme that seeks to conserve and protect vulnerable turtle populations while involving the local community in this process in a sustainable, meaningful way,” commented Simone Gregor, Head of DIFFERENT.ORG. DIFFERENT.ORG is a reputable online crowdfunding philanthropy platform funding projects in South Africa. You can rest assured knowing that there are no monthly subscriptions, no commission on donations and no credit card fees. This ensures that every cent goes to the Turtle Monitoring and Safeguarding Programme, to maximise impact.